If you're thinking about doing a similar road trip here are some thoughts and tips that may be helpful . . . I'm afraid that I'm one of those people who love maps and planning. So part of the enjoyment of this vacation for me was in the planning beforehand. To help, I bought Microsoft Streets & Trips from ebay as a better alternative to just using Google Maps. The software lets you build up circular routes, add overnight stops, add stops of any length of time at places of interest and provides maps and driving directions. So I managed to map out a feasible route and identify overnight stops easily. I also bought a great road atlas : Benchmark California Road & Recreation Atlas which we used on the road, far better than fold-out maps which never seemed very good quality (sorry America, but nothing beats the UK Ordnance Survey maps). For navigating through cities, especially Los Angeles and San Francisco, a Sat Nav (GPS) is essential in order to keep the nerves from fraying and saving time by not getting lost. A few years back I bought North American GPS maps on an SD card for my Garmin Sat Nav for around £40. This means that taking my Sat Nav with me to America saves having to pay through the nose by renting one from the car rental companies. It's been worth its weight in gold so many times in helping get us through towns and cities. But it won't be that useful when you're cruising along a road such as the Pacific Coast Highway, looking for places to stop at along the way, that's when the paper atlas comes into its own. Also if you need to make a detour, having a map in front of you helps immensely. As for deciding on where to have your overnight stops, I reckoned on a maximum of around 300 miles in a day which sounds a lot, but on rural highways with little traffic this is easily done. Often we did less to allow more time stopping and walking around places. The longest part of the road trip was the drive back from Flagstaff, AZ to Los Angeles at 465 miles and around 9 hours. But breaking this roughly halfway through the day at Oatman, AZ made even this distance easily do-able, especially with the two of us sharing the driving. You can book hotels / motels online, however we found that some wanted a deposit at the time of booking, others wanted full payment up front and others wanted full payment on checking out. Whilst you could handle this with a little organisation, it was more convenient to get everything paid for up front by using a travel agent to create a "tailor-made" holiday for you so that you only have to pay the travel agent for flights, car hire and accommodation. That said, every hotel required you to leave a credit card that was pre-authorised, i.e. funds ring-fenced on it for around 7 days - so don't use a prepaid credit card for this purpose or you won't be able to use your funds! This worked ok for us apart from one motel that despite having being paid by the tour operator in advance for our stay, charged our credit card for the full amount. The tour operator got this credited back to me before we got home so no harm done. As we were only staying overnight in a lot of the places we were happy to stay in chain motels, mainly sticking with Best Western. The rooms were spacious, comfortable and clean. Many had breakfasts included - all of the buffet style with a mixture of hot and cold foods. Choosing this type of accommodation helped keep the cost reasonable for such a long vacation. 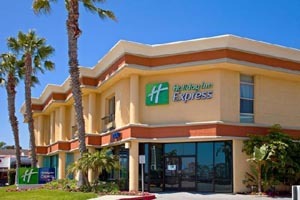 We stayed in the Holiday Inn Express in Newport Beach, which was a little nicer than the Best Western motels, but again although not a top class hotel it was very good and certainly conveniently located for beaches, shopping and access to the freeways. The easiest way to take money with you is by a prepaid currency card. We use Fairfx which allow you to top up the cards online using a debit card. The cards are free if you follow this link and top up a minimum amount of $75. You can purchase a US Dollar card or a Euro Card, each holding that currency for you to use as you please wherever you would use a credit or debit card. You can also use it to draw out cash in US dollars or Euros at ATMs whilst you're away. If you have anything left on the card when you're back home you can got to an ATM here and draw out the balance in GBP. The exchange rates are good and the only fees are nominal amounts when you draw out cash from ATMs. We also take some currency out with us so that we have some ready cash to start with, drawing out from the cards when needed.